Let blessed Dorothy, thy Virgin and Martyr, O Lord, sue for our pardon, who by the purity of her life, and the profession of thy virtue, was always well pleasing to thee. Through our Lord Jesus Christ, thy Son, who liveth and reigneth with thee, in the unity of the Holy Ghost, God, world without end. Amen. To-day again, it is one of the most amiable of Christ's spouses that comes to console us by her presence; it is Dorothy, the simple and intrepid virgin, who strews the path of her martyrdom with prodigies of sweetest charity. 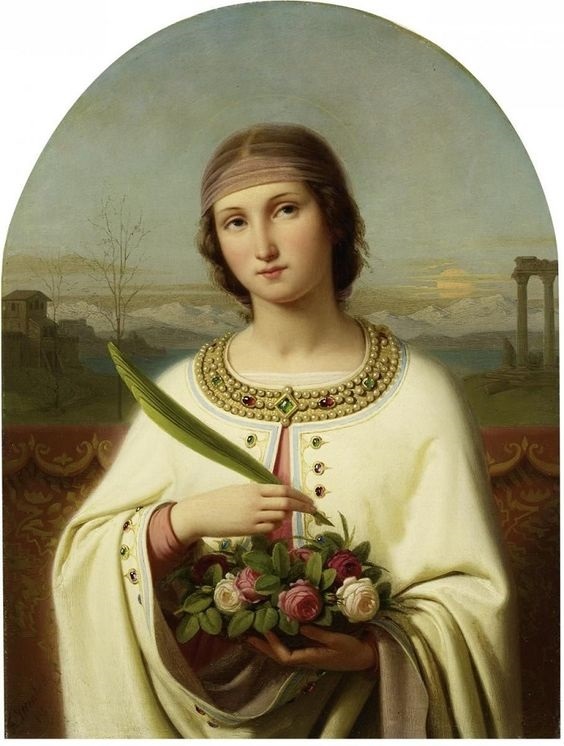 The religion of Christ alone can produce in timid women, like the Saint of to-day, an energy which, at times, surpasses that of the most valiant Martyrs among men. Thus does our Lord glorify his infinite power, by crushing Satan's head with what is by nature so weak. The enmity put, by God, between the Woman and the Serpent (Gen, iii. 15), is for ever showing itself in those sublime Acts of the Martyrs, where the rebel Angel is defeated by an enemy, whom he knew to be weak, and therefore scorned to fear; but that very weakness, which made her victory the grander, made his humiliation the bitterer. Surely, such History must have taught him how powerful an enemy he has in a Christian woman; and we, who can boast of having so many heroines among the ancestors of our Holy Faith, should cherish their memory, and confide in their protection, for their intercession is powerful with Him they died for. One of the noblest of these comes to us to day; let us celebrate her victory, and merit her patronage. The Lessons given in the Dominican Breviary are so much fuller than the Legend of the Roman Liturgy, that we have not hesitated to insert them here. The holy virgin Dorothy, of Cesarea in Cappadocia, was apprehended by Apricius, the governor of that province, on account of her professing the faith of Christ. She was put under the care of her two sisters, Chrysta and Callista, who had apostatised from the faith, and would be able to shake the resolute constancy of Dorothy. But she brought them back to the faith, for which they were burnt to death in a cauldron. The governor ordered Dorothy to be hoisted on the rack, and she said to him, as she lay upon it: “Never in my whole life have I felt such joy, as I do to-day.” Then the governor ordered the executioners to burn her sides with lighted lamps, and beat her for a very long time on the face, and finally behead her with the sword. Whilst she was being led to the place of execution, she said: “I give thee thanks, O thou the lover of our souls, that thou callest me to thy Paradise!” Theophilus, one of the governor's officers, hearing her words, laughed, and said to her: “Hear me, Bride of Christ! I'll ask thee to send me some apples and roses from this Paradise of thy Spouse.” Dorothy replied: “Well, and so I will.” Before she was beheaded, she was allowed a moment for prayer; when lo! a beautiful child came to her, bringing with him in a napkin three apples and three roses. She said to him: “Take them, I pray thee, to Theophilus.” Then, the executioner struck her head off with his sword, and her soul fled to Christ. Whilst Theophilus was jocosely telling his fellows the promise made him by Dorothy, he sees a boy bringing him in a napkin three fine apples, and three most lovely roses, who, as he gave them, said: “Lo! the most holy virgin Dorothy sends thee, as she promised, these gifts from the Paradise of her spouse.” Theophilus was beside himself with surprise, for it was February, and the frost most sharp; but taking the gifts, he exclaimed: “Christ is truly God!” He openly professed the Christian faith, and courageously suffered for the same a most painful martyrdom. February 6, 2019: St. Titus, Bishop and Confessor. St. Dorothy, pray for us.